I’ve had an iPhone for a while. I’ve had 3 of the 4 versions, actually. 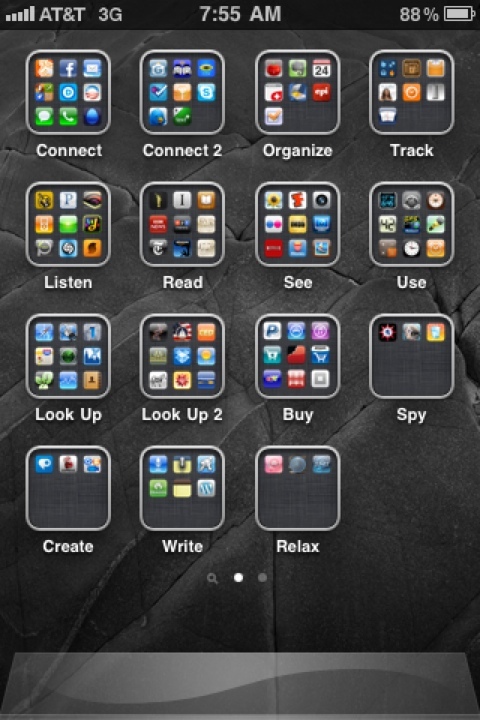 I’m trying something with the folders introduced back in iOS 4: I put every app into a folder, even Phone and Safari. Yeah, it’s a bit weird, I think. But it’s forced a new mental process that I like so far. I have to think about why I unlocked my phone. Before I’d grab my phone to look up a phone number and scan my email instead. I’d need to check my bank account and find I’d be surfing the stats of Waterlogged usage for the day. All good stuff. None of it what I intended. So I put together folders, not by topic, but by verb. I now have to say to myself, I want to look up a contact so I can send it to John. Amazingly, my apps can all fit on two iPhone screens, or a single iPad screen. I haven’t used the search screen to find an app, and I haven’t needed to check multiple folders to find the app I wanted. So far, it’s worked way better for me than “this screen is for games, and this screen is for productivity” ever did before. How do you organize your iPhone apps?